Copyright Kanagawa Prefecture All Rights Reserved. 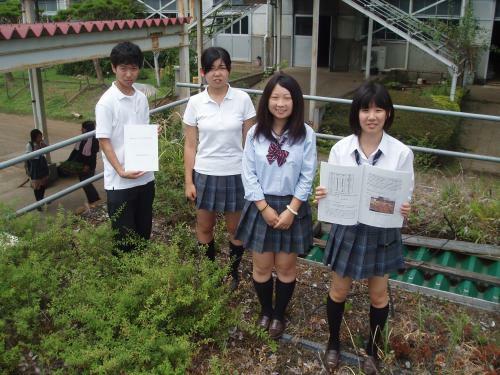 Kanagawa Prefecture announced on August 6, 2013, that joint research conducted by the students of Aihara Prefectural High School and a group of local small and medium-sized companies has proven roof greening using used tatami mats to be effective for cooling in midsummer and warming in midwinter. After compiling the results of their four years of research from 2007 to 2011, a technical report was submitted to the Japanese Society of Revegetation Technology. The purpose of the research was to green rooftops using solely renewable energy, by making use of discarded tatami mats, solar power and rainwater. Students in the Environmental Design Course at Aihara High School jointly conducted the research with Sagami Monodukuri Kenkyukai, a study group consisting of various small and medium-sized companies in Sagamihara City, and obtained a large body of data describing a cooling effect of 1.6 degrees Celsius in midsummer and a heat-retaining effect of 3.0 degrees Celsius in midwinter. Kanagawa intends to use the results to make effective study materials for environmental education, and promote the research as a roof-greening initiative for worldwide utilization and dissemination.